High level international performance in a rather new VITO research domain. Freshly appointed research leader Jef Hooyberghs (Sustainable Health) obtained a publication in the renowned Journal of the American Chemical Society, a first-off for VITO. 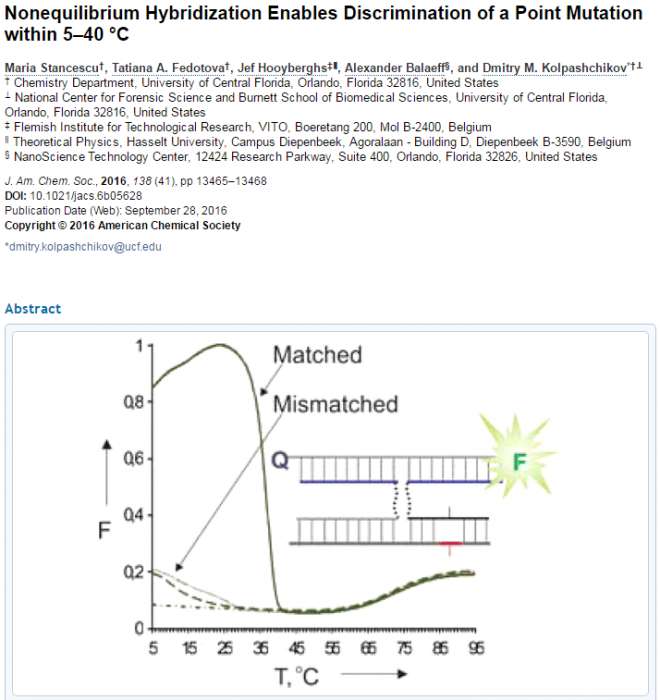 The published research was in collaboration with the University of Central Florida, the Nano Science Technology Center Florida and UHasselt. The DNA research is fundamental for the biomarker research at the unit Sustainable Health. Biomarkers are measurable parameters for the health condition of an individual, like for example biomolecules, but also blood vessel structure. Biomarkers play a crucial role in a future with a sustainable healthcare system. In the right context, they have a predictive value for the disease progression and for the response to treatment, thus enabling very early diagnostics and efficient therapy. VITO promotes the transition to a personalised health care with technological innovations for measuring these biomarkers and by studying their significance. On January 24, the article had already been read 571 times.